Driver Easy for Windows 7 - A tool to control the relevance of drivers installed in the operating system. The utility simplifies the search for software, taking all the routine operations on themselves. The built-in verification module finds new versions, notifying the user. Provides recommendations, following which you can clearly determine which updates are critical. The program interface represents a tabbed window that displays a specific component of a computer for which a separate group of drivers is needed: a motherboard, a central processor, a video controller and a monitor, and peripheral devices. 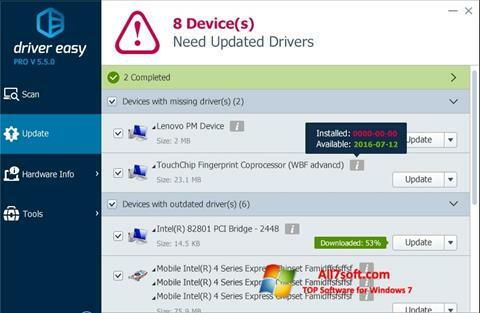 You can free download Driver Easy official latest version for Windows 7 in English.